Prince Rupert BC, May 24, 1959. A pair of GP-7's have just returned from a trip through the wye. The CNR ran long nose forward. Since the ditch lights were bolted onto the nose of only one unit, the set had to be turned. The 4822 will be the lead power pack for 922,the late evening Time Freight heading up the Skeena River and beyond to Red Pass Junction. Pooled power on the Western Extension was such that only occasionally did a unit show up that I hadn't taken a photo of. When I spotted something new in town, I'd shoot it if I had my camera along, and lose it if I didn't. At age 15, I was working part time as a box boy at Three Boys Market on the weekends, cutting into my train photography. Of more significance, I had begun cultivating a new phase of my life, a lady friend! I discovered early on, that a man has to learn to prioritize correctly or pay the price! So railroading was struggling to maintain a foothold! Somewhat of a curiosity, this is one of four units delivered without dynamic brakes in this class. 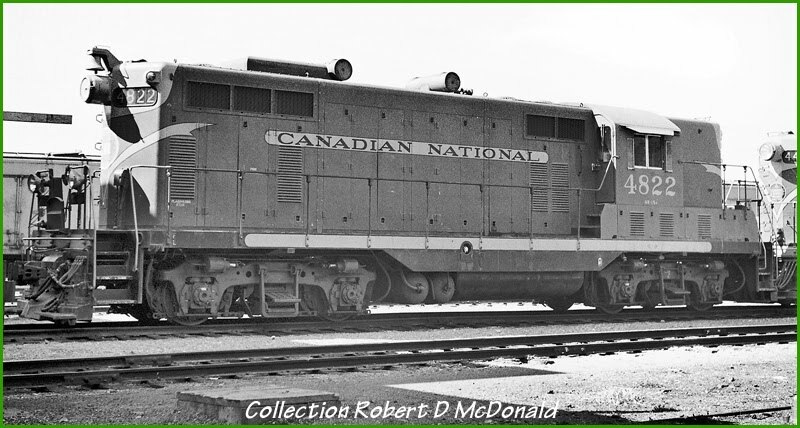 Not completely an outcast, there were a number of GP-9's built for the Grand Trunk Western without dynamics. While it may seem like no big deal if you were used to seeing units without dynamic brake blisters, to me, these units seemed "unfinished." Also noteworthy, this unit has Blomberg trucks, wherein succeeding orders shipped with Flexicoil's. This series were the only Geeps to be equipped with the Pyle "barrel" headlamps. Subsequent orders came with twin sealed beams. 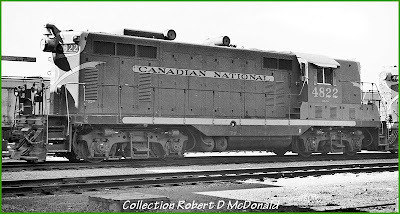 She has the smaller 1,000 imperial gallon fuel tank to save weight, and of course, the Canadian invention - the ditch lights - were still an add-on, not a factory option. 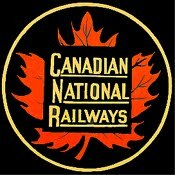 Railroad stuff: Canadian National Railways 4822. Built as GP-7, 1,500 hp, road number 7577, November 1953, serial number A-556. Renumbered 1722 9/54, 4372 6/56, and 4822 in August 1957. 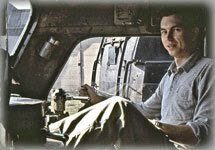 Retired in June, 1975. Scrapped in March 1980. Pinched or Screwed at the Pump? "Out of conflict ... accord." Amtrak Cascades: Coming & Going!